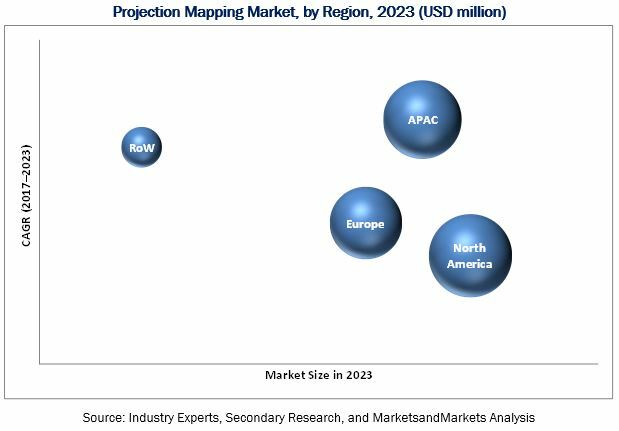 [132 Pages Report] The overall projection mapping market was valued at USD 1.06 billion in 2017 and is expected to reach USD 3.56 billion by 2023, at a CAGR of 21.10% between 2018 and 2023. The projection mapping market in APAC is growing at the fastest rate. APAC is becoming one of the favorable regions for media, sports, and corporate events across the world. 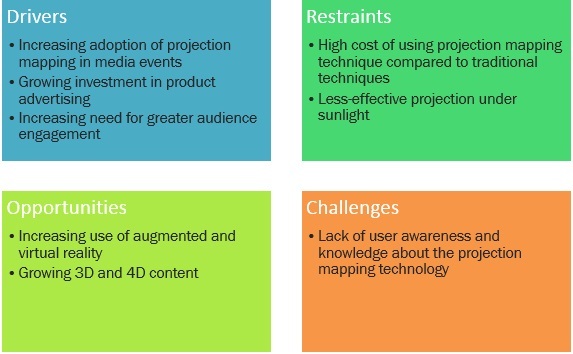 All these factors are expected to boost the projection mapping market in these regions. Singapore is one of the major markets for projection mapping in APAC with a high number of events and festivals that are held in Singapore. The base year used for this study is 2017, and the forecast period considered is 2018–2023. Most of the suppliers have opted product launch and development and acquisition as the key strategies. Where will it take the industry in the mid to long term? The projection mapping ecosystem comprises manufacturers, solution providers, distributors, and software and services providers such as Panasonic Corporation (Japan), Seiko Epson Corporation (Japan), Barco NV (Belgium), Christie Digital Systems (US), and BenQ Corporation (Taiwan). The report also includes companies such as Digital Projection (UK), Optoma Corporation (US), NEC Display Solutions (Japan), Vivitek (Taiwan), Green Hippo (UK), AV STUMPFL (Australia), Resolume (the Netherlands), HeavyM (UK), GarageCube (Switzerland), Bluepony (US), Lumitrix (Czech Republic), ViewSonic (US), and NuFormer (the Netherlands). “The study answers several questions for the target audiences, primarily which market segments to focus on in the next 2–5 years for prioritizing efforts and investments. Europe (UK, Germany, Italy, Spain, France, and Rest of Europe (Poland, Sweden, Russia and the Netherlands). Asia-Pacific (Japan, China, South Korea, India, and Singapore, and Rest of APAC (Taiwan, Australia, Thailand, Bangladesh, Malaysia, and Vietnam). North America is expected to hold the largest share of the projection mapping market by 2023. The projection mapping market in North America is estimated to grow considerably in the coming years as North America is major hub for corporate events, shows, and sports events. The growing availability of 3D and 4D content and increasing use of augmented and virtual reality are expected to boost the projection mapping market by creating opportunities during the forecast period. There is a growing demand for 4-dimensional content projection as it creates more attentive environments for all the applications during the forecast period. Events include corporate events, concerts, sports events, product launches/promotions, and government-sponsored events. Generally, high-brightness projectors based on the three-chip model are used for these applications. They can project large images depending on the requirement of the content. A large number of upcoming sports events such as the 9th FIFA U-20 Women's World Cup (France), 33rd Winter Olympics  (Korea), and others offer great opportunities for projection mapping during opening and closing ceremonies of the events. Key restraining factor is the high cost of projection mapping technique compared to traditional techniques. Lack of awareness and knowledge about the projection mapping technology is acting as a major challenge for the growth of the projection mapping market.